The first ethnic Turkish head of a German political party has dismissed any comparisons between himself and US President-elect Barack Obama. 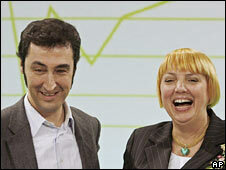 Cem Ozdemir, who was elected co-leader of the Green Party at the weekend, told Germany's Bild am Sonntag newspaper such comparisons were "inappropriate". "It is enough for me to be Ozdemir of the Greens," the 42-year-old said. Mr Ozdemir's rise has prompted comparisons with that of Mr Obama - who will be the first black US president. At the Green Party's weekend conference in Erfurt, eastern Germany, some of Mr Ozdemir's supporters even wore badges that read "Yes We Cem", in reference to an Obama campaign slogan. Mr Ozdemir was born to Turkish Muslim parents in south-western Germany. In 1994, he became the first ethnic Turk to be elected to the country's parliament. In 2004, he won a seat in the European Parliament. There are nearly three million ethnic Turks in Germany - making it the country's largest ethnic minority.